Mole removal is a common request. This may be because a mole is changing and there is concern about possible skin cancer. Sometimes a patient is just not happy with the appearance or position of a particular mole and this is termed cosmetic mole removal. Other patients may want mole removal because the mole is a nuisance and catches on clothing or while combing, or perhaps gets cut while shaving. Before removal, the mole should be closely examined using a dermatoscope by a doctor who is experienced in diagnosing and treating skin cancers. Anything less than this means risking that a melanoma may be incompletely removed and may subsequently recur and even spread through the body. A new mole, or any mole that has changed at all in colour or size, or has become itchy or has bled, should always be treated with suspicion that it may be a cancer. If you have such a mole please contact Skin Alert Cairns as soon as possible and state your concern about a specific mole and ask for an urgent spot check appointment. We endeavour to see such patients the same day if possible to check the lesion of concern. Melanomas are often diagnosed in this way. Mole removal is almost always performed by full excision and suturing if there is any suspicion of skin cancer. 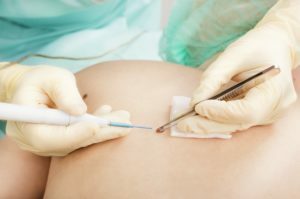 What is involved in mole removal? If a mole has not changed, and is clinically benign, then it may be removed using several techniques, including shrinking the mole using a fractional laser (can take several treatments, but has the advantage in that it does not require a needle, only topical anaesthetic), shave excision, radiofrequency ablation using the Ellman Surgitron, or laser ablation. Dr Candler has a lot of experience in this area and the expectation is for an excellent cosmetic outcome for this sort of procedure. Which technique to use for mole removal is generally based on the size and location of the mole and the cosmetic implications. Generally mole removal involves minimal discomfort for the patient, even if local anaesthetic is required. While there is no such thing as an invisible mend, many moles can be removed with minimal scarring and Dr Candler has a lot of experience and expertise in this field. If any mole does need excision, you are in safe hands, as Dr Candler is known for his meticulous excision and suturing technique. Other skin lesions such as cysts and skin tags or "age spots" (the common name for a seborrheic keratosis) can also be removed. The cost of mole removal is calculated on an individual basis, and will vary depending on size, location and type of mole or lesion and the technique used. If you have any moles or other skin lesions that you wish to have removed, contact Skin Alert Cairns and book an appointment. Remember to state clearly if you are particularly concerned about any lesion that is changing. In that case you should ask to be given an urgent “spot check” appointment. For cosmetic mole removal, ask for an appointment with Dr Candler.